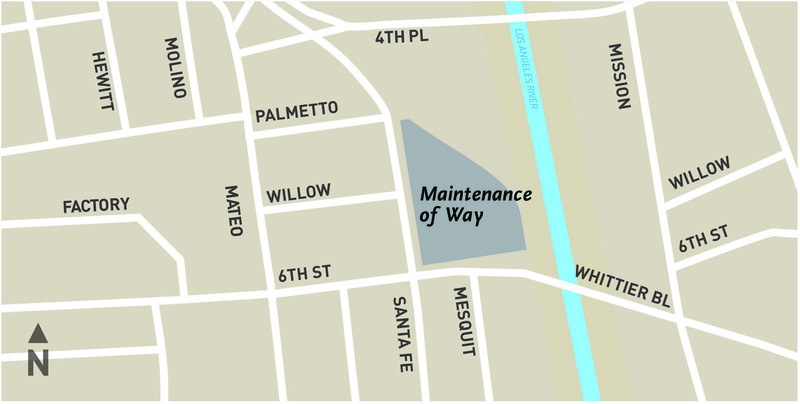 Metro’s Location 64 Maintenance of Way (MOW) Building is being constructed at 590 South Santa Fe Avenue, adjacent to the new City of Los Angeles 6th Street Bridge in the Arts District. The proposed maintenance of way facility will repair and maintain the track vehicles that in term maintain and repair the Red and Purple Line tracks, track signals, subway train control, communication, fire protection and security systems. In addition to housing the Red and Purple Lines’ non-revenue maintenance staff, the new facility will house the Rail Operations–Maintenance of Way Group and a section of Metro’s Rails Parts Storage Group. Gruen Associates designed the three story, 86,000 square feet building, which features a first floor dedicated warehousing non-revenue vehicle parts, multiple bays for repairing non-revenue vehicles, vehicle wash rooms and a small lobby. The second floor houses offices, training rooms and conference rooms for all three rail operations staff. The third floor is dedicated to storing tools and parking operating non-revenue maintenance vehicles. Throughout the design process, the Design Advisory Working Group (DAG), composed of Arts District leaders and artists, were engaged in reviewing and commenting on the building’s exterior design. Ball-Nogues Studio, a Los-Angeles-based design studio, is responsible for designing the building’s artwork. The MOW Building is currently being constructed by Clark Construction. The building is expected to be completed by spring 2019 and will operate 24 hours a day, 7 days a week. While the MOW Building is an independent Metro facility and not considered part of Metro’s Division 20 Red and Purple Lines Yard, the new MOW building will increase maintenance capacity for servicing the subways. Metro Division 20 and the MOW facility are connected via the southern tracks.